The rosary is a wonderful tool for prayer and meditation, especially when you’ve had a little training in meditation techniques, be they Christian, Buddhist or Hindu. Praying the rosary is like ringing Mother Mary’s doorbell. She knows the sound means she’s wanted and so she comes running and allows the soul to bathe in her presence, bringing with her the whole trinity. Unfortunately many modern-day Catholics dislike this prayer intensely, whether lay or ordained. I’ve heard nuns say: "I hate the rosary!" A priest once recommended that I do a "higher form of prayer". There are several reasons for these negative feelings: 1. For generations Catholic children were forced to recite the rosary. 2. It has commonly been used as a penance for sins and hence it came to be associated with punishment rather than with joy. 3. Catholics get confused as to who they are supposed to pray to. Often your words are addressing Mary but you are told to focus your mind on Jesus. 4. Many people find it thoroughly boring and senseless to repeat the same prayer over and over. They were never taught the purpose of this. 5. People get discouraged by all the normal obstacles to meditation because they are never instructed in how to deal with them. Here is how I, as someone who has been instructed in Tibetan Buddhist meditation as well as in "Centering Prayer" (Christian meditation) approach the rosary. It is certainly not the only way to do it. There are as many ways as there are individuals praying. I share what it is like for me just to encourage you to experiment with what might work for you. In order to be able to "pray from the heart", as Our Lady of Medjugorje urges us to do, I have to start any prayer by checking into my heart. I breathe into it, see how it feels, without judging it as good or bad, right or wrong. Just offering the heart my breath, presence, and compassion will always help it. Then I gently introduce the idea of Mother Mary and check whether my heart is ready to pray. You can’t force a heart to pray. If you try, it just ends up hating the idea of prayer. If my heart is not ready, I give it more quiet time. Eventually it’s usually ready to be with God. If not, I just rest and do nothing, until I can hear God calling and am willing to respond. Note that I don’t see a need to distinguish between Mary and God. One leads to the other; they have united as one and act as one. Who am I to separate what God has united? So when I feel a divine presence, I don’t worry about whether it’s God the Father, Jesus, the Holy Spirit, or Mary. Now, if you have a rosary, you’ll hold the crucifix and you are to recite "the Apostle’s Creed", i.e. the list of things a Catholic is supposed to believe. Again, it’s not something one can force. Reciting a story you disbelieve is not very inspiring. So just tell God and yourself what you do actually believe. This is a powerful practice. Our Lady of Medjugorje once said that the Creed serves as an antidote to atheism and materialism in the world. So if all you can manage at first is: "I believe in God", you’re doing great. Little by little other parts of the Creed may come alive for you. It’s always good to at least try the instructions of the Church on for size and give them the benefit of the doubt. Sometimes your mind may reject something that your soul is actually quite comfortable with. Sometimes you grow into something that didn’t fit at first. Other times you grow out of something. Always turn to the Holy Spirit as the supreme teacher. S/he will guide you step by step, giving you just what you need at every turn of the way. On the bead above the crucifix you recite one Our Father. Again, I use the freedom God gave me to pray authentically. How else could I pray from the heart? So when I am alone, I don’t pray: "Our Father who art in heaven…" but: "Our Father and Mother who art in heaven and on earth…" Similarly, I don’t start the Creed with: "I believe in God, the Father almighty…" but: "I believe in God, the Father and Mother all-present, all-knowing, all-loving, almighty…"
On the three following beads you recite three Hail Marys: "Hail Mary, full of grace, the Lord is with thee, blessed art thou amongst women, and blessed is the fruit of thy womb, Jesus. Holy Mary, Mother of God, pray for us sinners, now and at the hour of our death, Amen." Some people object to routinely referring to themselves as sinners. They think this constitutes negative reinforcement. The idea is to reinforce humility, which is next to godliness. But as long as it feels destructive, I guess it’s o.k. to say: "pray for your children, now and at the hour of our death, amen." Some days though, you must know you’ve been bad and then it’s healthy to acknowledge that and sit with that for a while. Personally, even when I feel good about myself, praying for "us sinners" gives me a chance to include the whole human race in my prayer, including the warmongers, politicians I don’t like, killers, etc. I remember when I was first instructed to do a Buddhist purification practice. I did it once and felt so pure afterwards that I couldn’t see the need to do 100,000 more of those long mantras. But a friend of mine said: "As long as you think you exist as a separate person, you still have something to purify." That always stuck with me. As long as our experience is not like Paul’s when he says: "It is not I who lives, but Christ in me" we still have the seed of negativity in us. One thing I love about the Hail Mary is that it reminds us of the hour of our death. Every religion, especially Buddhism, stresses how important it is to be mindful of our impermanence. Praying about it every day is a good practice. On the next bead I recite: "Glory be to the Father (and the Mother), the Son (and the Daughter) and to the Holy Spirit, as it was in the beginning, is now and ever shall be, world without end, amen." Now you are ready for the 15 "mysteries". Every decade of 10 Hail Marys is under the tutelage of a "mystery" – a scene from the lives of Jesus and Mary. St. Ignatius of Loyola, founder of the Jesuits, recommends putting yourself into those scenes, not intellectualizing about them, but just being there with an empty, open mind. Then the Holy Spirit will teach you through them spontaneously, without your mind having to understand anything. Instead you may feel something change in your energy, in your emotions, or in your body. If you follow the Holy Spirit, praying the rosary won’t be about visiting some story that happened 2000 years ago; it’ll be about bringing Mary and the trinity into the present, into your body and soul. There are 5 joyful, 5 sorrowful, and 5 glorious mysteries. I love how this rhythm acknowledges that life has joyful, sorrowful, and glorious phases. It also tells me that you don’t get to the glory until you’ve fully allowed the experience of joy and sorrow. When I first started praying the rosary and I still had some really bad days at times, I used to look forward to the sorrowful mysteries, because it allowed me to sit with sorrow without any resistance or judgement that sorrow is bad. And then of course it would transform, as any suffering you quit resisting eventually transforms. Traditionally one is instructed to focus on these mysteries, while using the Hail Marys as a sort of mantra: you don’t think about the meaning of the words you recite, you just feel the energy and blessing it conveys. It provides a sacred screen onto which the mysteries can be projected. But here again, follow your heart and the Holy Spirit. Sometimes just reciting the Hail Marys brings on such a strong sense of Our Lady’s presence, that I just stay with that and ignore the changing mysteries as much as possible. Other times certain mysteries have a strong pull. Then again, God may draw me into complete silence of words and thoughts, and I know that’s always a good place to follow into and remain in as long as one can. When the mind starts wandering again, I return to the rosary. How do I know that silence is the best way of being with God? A, because the masters of all religions agree that the most intimate union between God and the soul happens in silence. B, because the Bible confirms the value of silence. Here are just three examples: "Be still and know that I am God." (Psalm 46:10) "Be still before the Lord and wait patiently for Him." (Psalm 37:7) "Be silent all flesh before the Lord." (Zephaniah 2:13) C, because Mother Mary requested in Fatima that when we pray the rosary, we spend fifteen minutes in silence. D, because in Medjugorje she said on 7-25-1998: "In the silence of the heart, remain with Jesus, so that He may change and transform you with His love." Why then should we not skip all those words and mysteries and just remain in silence? Because we usually can’t. We may look silent from the outside, but inside our mind is often chatting up a storm or falling asleep. I’ve seen Buddhist monks fall asleep by the row. I think it’s more efficient to follow God into silence when s/he knows we’re ready and draws us. On the other hand, it all just takes practice, no matter what method of prayer the Spirit leads you to. Back to the rosary: If you get so distracted or bored that you can’t focus at all, neither on mysteries, nor on God’s presence in the Hail Marys, here is what you can do. First of all, don’t take it personally. It’s got nothing to do with you in particular; it’s just what the mind does. These are perfectly normal obstacles on the path. The more you practice, the more they will diminish. Most likely they’ll never dissolve completely, but that doesn’t matter. Even one true moment with God is worth sitting there, bored and distracted, for an hour. Try not to resist boredom. It is the threshold to divine peace. The Tibetans say: "Real meditation doesn’t start until you’re bored. Before that you’re just playing with your mind." So when boredom comes, like anything else that may arise during prayer and meditation, just notice it without judging it as good or bad, right or wrong. Just be with the experience without any resistance. If you manage to do that, it will soon transform into an indescribable peace. Expect distractions and don’t beat yourself up when they happen. Instead, every time you notice that you’ve completely forgotten about your prayer and meditation, return to it with the utmost gentleness. Try not to have any further emotion caught up in the fact that you were distracted, it just adds more distractions. Even if you are distracted 80-90% of the time that is not at all unusual. But every time you remember your meditation (maybe because you are fumbling around with a rosary) and you return to God’s presence, it’s like the prodigal son or daughter coming home. It’s a happy occasion, and the more often you get distracted the more often you can experience that happy homecoming. So, the more Hail Marys you have promised to recite, the more chances you have at getting distracted and returning home to God and to your true self again and again, until one day you may be able to stay home for good. In order to become more confident with meditative prayer practices, I would recommend reading more about it. There are great Christian meditation teachers like Thomas Keating. But reading about Buddhist or Hindu meditation is also valuable, because for millennia these religions have been focusing on teaching meditation. Charlene Spretnak, a catholic philosopher, professor, and author of "Missing Mary: The Queen of Heaven and Her Re-Emergence in the Modern Church", is just one of countless Christians who acknowledge how much Eastern meditation has helped their Christian spirituality. She learned to calm her mind with Vipassana meditation and now uses that skill while praying the rosary. Now let’s look at the individual mysteries. This is when the angel of God comes to Mary to announce her conception of Jesus. – I was lucky enough to receive some meditation instructions from a Jesuit priest in graduate school. He encouraged us to recall this scene and to imagine that we were either Mary, or the angel, or God, depending on how the Spirit moved us, and then to just see how that feels. Without him I probably never would have dared to imagine being any of those. So when you imagine a scene, just wait and see if the Spirit draws you into or to any particular person, or maybe a particular shade of light, or maybe even an object. Anything can happen here, if you leave the Holy Spirit in charge. Today I just had a sense of big wings and lots of feathers in front of me and a tiny glimpse of what it might have felt like to be "overshadowed by the Holy Spirit". Other times the emphasis is on the promise that indeed one day (though maybe not in this life) I will conceive God into my very being and become one with Him/Her/It. It could happen at any moment and I should be ready at any moment. 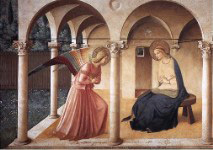 The annunciation brings up questions for me: "Am I ready to house God in my body? Am I willing to offer my whole life in service to God and humanity?" Sometimes I notice how I may continually say that my goal is divine union or enlightenment, but part of me really doesn’t want that to happen any time too soon, because it would kind of change my whole life. So then those two voices need to dialogue peacefully. 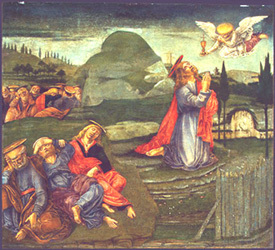 This is when Mary goes to see her much older cousin Elizabeth who is also miraculously pregnant with John the Baptist. Upon seeing Mary, Elizabeth’s baby leaps in her womb, she is filled with the Holy Spirit and exclaims: "Blessed are you among women and blessed is the fruit of thy womb! Blessed are you who believed!" To me, this is about love between spiritual sisters, about supporting each other on our path, about recognizing the divine in all people and helping it get seen. If I’m concerned about any particular conflict between people, I dedicate this mystery to them. The birth of Jesus. Here I always pray that Jesus and Mary may be born in me. Today the sense was that nurturing an infant in your womb and then giving birth to it is not only joyful but also hard work and pain. Yet, when the work of giving birth to God into this world is challenging or painful, it is still also joyful because it’s so worth it. Mary and Joseph bring Jesus to the temple for the customary "consecration to the Lord". At this occasion the prophetess Anna and Simeon recognize the Messiah and the latter predicts his success as well as his suffering. To me this is about presenting my precious, vulnerable inner child, the seat of Christ in me, to God in his temple. The whole world is God’s temple and it’s often scary to expose myself to it, but with practice it becomes easier. Mary and Joseph have lost the 12 year old Jesus at a festival in Jerusalem and can’t find him for three long days. Finally they discover him where he thought it should have been obvious: in the temple. According to Paul, our bodies are the temple of the Holy Spirit. Yet we desperately search for God everywhere, except in that temple. Even when you know where to look, it’s not so easy to recognize Jesus within. For me, this mystery is a prayer to find and recognize Jesus in me and in the whole world – God’s greater temple. If you meditate in the Jesuit style the last three mysteries are all about contemplating God in his complete humanness. You get to witness Mary laboring to bring Jesus into this world. You see the seven day old bundle of a God-baby and then the twelve year old God-boy. This should help us contemplate God in everyone we’re with, including ourselves. The night before Jesus’ crucifixion. He’s scared; he’d like to be able to avoid what’s coming, but he surrenders to the Father’s will. He asks his disciples: "pray with me and stay awake with me." But they fall asleep, abandoning him. I love this mystery, because here I see Jesus wanting to be with me, wanting me to pray with him and being upset if I forget him and fall asleep on him. It reminds me of Our Lady of Lourdes who also would get a little irritated if Bernadette ever got distracted from her during an apparition. Not that I need to beat myself up for getting distracted, which is perfectly normal, but it helps me to think somebody cares. Not wanting to offend or sadden my divine family is an added incentive to pay attention. It makes the magnetism stronger. On other days this is the time to unite with Jesus in any feelings of abandonment, fear, or not knowing that I may be experiencing. If someone asked me to pray for them because they’re scared of something, I dedicate this mystery to them. Jesus is flogged and beaten. – This is a hard one to get into for me. I don’t usually get too close, but focus on the Hail Marys and on the general idea of opening to the reality of suffering without resistance. Like all of the sorrowful mysteries, this one deals with the question: "What do I do in the face of suffering, whether it’s my own or others’? How do I keep myself from shutting the world’s suffering out?" The answer is: "Pray, keep God/dess at your side, stay open, stay in love, don’t resist." If I do get closer, I feel Jesus’ love, and his sacrifice, the pain he accepted for our sake. Much like the great Buddhist bodhisattvas (enlightened beings), Jesus purifies our negativity by taking it upon himself. The Eastern masters say, in order to really profit from a bodhisattva’s sacrifice one has to rejoice in it, appreciate it with thanksgiving, rather than feel guilty for it. Our joy is what transfers his merit to us. Joy opens the heart to receive the blessings of Jesus’ sacrifice (whether one calls him God or a bodhisattva). It focuses on him. Guilt usually focuses on oneself; it is only good if it opens the heart. Today I just felt Jesus’ face, crowned with thorns, real close to mine. Nothing has to be thought or understood to receive blessings. When I’m less inspired and more in my head, I take a moment to contemplate the crown of thorns as a symbol of mastering the mystery of suffering. According to the medieval mystics, there is great peace and freedom and joy to be gained from accepting suffering. I believe them; I’ve had glimpses, but I have a long way to go. May the crown of thorns teach me what I’m ready for. In Buddhism too, you can’t enter nirvana until you know the "noble truth of suffering" in every detail and without any resistance or attachment. In the Gospel Jesus specifically asks all of us to pick up our crosses and follow him. Carrying one’s cross, means accepting one’s life just the way it is, however it is, the good, the bad, the ugly, and the bliss. It’s about being in the present moment, without any resistance, even when I’m happy. When everything is good in my life and I pick up that "cross", my peace deepens to encompass all of creation in the present moment. Other times everything is good but there is still the cross of just being human in a suffering world. Picking up that cross, means I am aware of the peace and the imperfection at the same time. It’s a peace with compassion, a tiny taste of what a bodhisattva might feel like who could be in nirvana or heaven, but chooses to share this world with us fools for our sake. For me, this is a time to practice total surrender to God’s will and presence. I often spread my arms to their sides to stretch open. Thus I concentrate on holding still for God, no matter what, even when I’m afraid he might rip my heart open. Especially since Mel Gibson’s "The Passion" I have this sense of Jesus coming out of the earth, out of the dark cave, sprouting into the light of our world from deep in the earth. Like the Easter song says: "Now the green blade rises from the buried grain, wheat that in dark earth many days has lain; laid in the earth, like grain that sleeps unseen; love is come again, like wheat arising green." When I am with Jesus during the resurrection, I get to root deep into the dark earth and then sprout into the light. 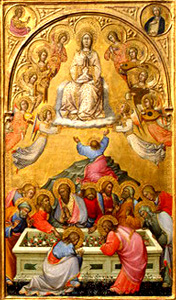 Jesus ascends into heaven while his disciples look on. – When I put myself into this scene, among the disciples, my heart wants to break. It’s so hard to let Jesus go. But there is no choice. 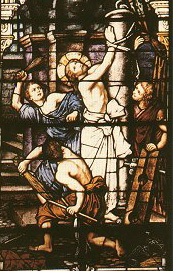 He says to us what he said to Mary Magdalene after his resurrection: "Stop holding on to me!" (Also translated as: "Don’t touch me!" John 20:17) One has to let go of everything, even all ideas about Jesus, emptying oneself completely, in order to receive the Holy Spirit who gives everything back a hundred fold. Rather than praying about or imagining, just be there with the disciples and Mother Mary and receive the Holy Spirit. Let it be so. Rather than allowing her body to die, God lovingly scoops up his mother, daughter, and spouse and lifts her straight into heaven. Many people, even Catholics, don’t believe in the assumption of Mary. But I don’t have a problem with it, because I’ve read stories about accredited Marian apparitions where she expresses consent and appreciation for this dogma. (Just like she confirmed the Immaculate Conception in Lourdes.) If it makes her happy, it makes me happy too. To me, the question is not: "What is historically true?" but: "What happens in my mind and heart when I imagine this to be true?" If it’s a meditation that leads me or others towards divine union, more power to it! If, in order to augment the power of the Queen of Heaven on earth, certain cultures have to think of her as immaculately conceived, ever virgin, and assumed into heaven, that’s fine with me. To me, the lesson of this mystery is the same as with Jesus’ ascension: Getting close to Jesus and Mary is like aiming an arrow of love at God – first you put a lot of effort and care into aiming and drawing the bow string, then you let go. You can’t hit bull’s eye until you let the arrow fly. Similarly, we have to let Jesus and Mary go at some point, at least temporarily. If nothing else, to make sure we’re not suffocating them with our ideas about them rather than directly experiencing their hearts – their core being. How do we know when it’s time to let go? When the ascension and assumption come around. They say, every time we pray the rosary, Mother Mary is crowned with another crown of roses. 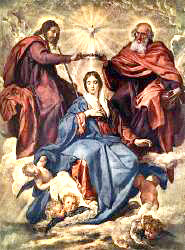 So the coronation is not just about God crowning his spouse, mother, and daughter, but also about us crowning her. Are you ready to crown her the queen and commander of your life? If yes, you get to bathe in her glory. Now, having read all this, please clear your mind of it all and go make your own experiences. Each decade ends with a "Glory be", then you announce the next mystery and start that with an "Our Father". People also intersperse other optional prayers. You may end after the last mystery with any prayer you like. 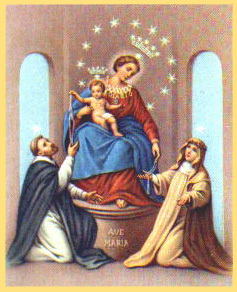 One that is commonly used is: "Hail Holy Queen, Mother of Mercy, our life, our sweetness, and our hope. To you do we cry, poor banished children of Eve. To you do we send up our sighs, mourning, and weeping in this valley of tears. Turn then, O most gracious advocate, your eyes of mercy towards us; and after this our exile, show unto us the blessed fruit of your womb, Jesus. O clement, O loving, O sweet Virgin Mary!" I have determined that the biggest obstacle to a regular practice of any prayer or meditation is not distractions or boredom or sleepiness. It is simply resistance to stopping whatever it is we are doing and sitting down to do nothing but "waste time with God". In order to stop, one has to overcome the first Newtonian law of motion called "inertia". It says that, left to its own devices, an object at rest will stay at rest, and an object in motion will stay in motion. To change its motion it takes an outside force. I used to tell people: "I’m not lazy and undisciplined, I’m just inert!" If you can get yourself to stop and sit down, the battle is basically won. But in order to overcome inertia; most of us have to apply an outside force like God, Mother Mary, a vow to pray the rosary every day, a bell that goes off and tells us: "It’s time to drop everything and pray!" I find the rosary so helpful in this because it soothes my mind. I don’t have to think about going from an active state to doing absolutely nothing, from 100 miles per hour to 0. Instead I can feel like I’ll "do the rosary", I’ll be handling beads and even if I can’t promise that my mind will be calm and collected, I’ll at least be able to do the recitations and fulfill my commitment. Then, once I’ve picked up the beads, my mind gradually calms down and pretty soon I’m perfectly happy doing nothing. Many people think silent meditation is superior to praying the rosary, but if they can’t get themselves to actually do it, what good does their "superior method" do? Better to use the rosary as a break mechanism for slowing the mind down and then let God draw you into silence when you’re actually ready.